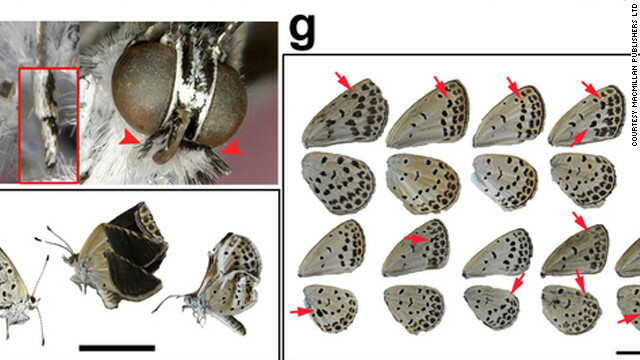 This image from a study on Fukushima's impact on butterflies shows wings mutated by the radiation. In the first sign that the Fukushima nuclear disaster may be changing life around it, scientists say they've found mutant butterflies. Some of the butterflies had abnormalities in their legs, antennae, and abdomens, and dents in their eyes, according to the study published in Scientific Reports, an online journal from the team behind Nature. Researchers also found that some affected butterflies had broken or wrinkled wings, changes in wing size, color pattern changes, and spots disappearing or increasing on the butterflies. The study began two months after an earthquake and tsunami devastated swaths of northeastern Japan in March 2011, triggering a nuclear disaster. The Fukushima Daiichi plant spewed radiation and displaced tens of thousands of residents from the surrounding area in the worst nuclear accident since the 1986 Chernobyl disaster in Ukraine. In May 2011, researchers collected more than 100 pale grass blue butterflies in and around the Fukushima prefecture and found that 12% of them had abnormalities or mutations. When those butterflies mated, the rate of mutations in the offspring rose to 18%, according to the study, which added that some died before reaching adulthood. When the offspring mated with healthy butterflies that weren't affected by the nuclear crisis, the abnormality rate rose to 34%, indicating that the mutations were being passed on through genes to offspring at high rates even when one of the parent butterflies was healthy. The scientists wanted to find out how things stood after a longer amount of time and again collected more than 200 butterflies last September. Twenty-eight percent of the butterflies showed abnormalities, but the rate of mutated offspring jumped to 52%, according to researchers. The study indicated that second-generation butterflies, the ones collected in September, likely saw higher numbers of mutations because they were exposed to the radiation either as larvae or earlier than adult butterflies first collected. To make sure that the nuclear disaster was in fact the cause of the mutations, researchers collected butterflies that had not been affected by radiation and gave them low-dose exposures of radiation and found similar results. "We conclude that artificial radionuclides from the Fukushima Nuclear Power Plant caused physiological and genetic damage to this species," the study said. The results of the study bring up concerns about the larger impact of the Fukushima disaster and the impact it will have on the ecosystem in Japan and nearby areas, as well as what we can learn for future nuclear disasters. "Our results are consistent with the previous field studies that showed that butterfly populations are highly sensitive to artificial radionuclide contamination in Chernobyl and Fukushima," the study said. "Together, the present study indicates that the pale grass blue butterfly is probably one of the best indicator species for radionuclide contamination in Japan." One of the researchers, Joji Otaki, an associate professor at the University of the Ryukyus in Okinawa, told reporters that while butterflies may be the best indicator, the study should also lead to more research on what else may be affected by the radiation. "Sensitivity (to irradiation) varies between species, so research should be conducted on other animals," Otaki told the Japan Times. Otaki said while there is still plenty of research to be done on radiation, there shouldn't be large-scale concern about this kind of mutation in humans. "Humans are totally different from butterflies and they should be far more resistant" to radiation, he told the newspaper. Cant wait for Master Splinter to be exiled to new york just before his mutation. Just remeber to send him 4 pet Turtles. TMNT...Turtle Power. Sooooo........where are all the startling pictures of these anomalous butterflies? If they are being described, why no pictures? Oh, no one has a camera, no one has a camera capable cell phone? Give me a break here!! They're at the top of the article. Kind of hard to miss. As to thundralight, Tesla's idea was to transmit energy, not generate it. He would still need nuclear, coal, or other sources of electricity, paid for by someone else who doesn't mind getting no profit for it. The only power source large enough to get us off problematic energy sources is the sun, and solar panels simply aren't developed well enough to do the job yet. Also, Tesla's design is far, far more likely to be carcinogenic than the cell phones people are paranoid about, while simply sticking 10-20 years more advanced solar panels on everything is a far more workable solution, and solves the issue of who pays for it. We'll still need nuclear for certain tasks, but it would give your "free" energy, or at least it's nearest equivalent. Mutants and monsters and freaks, oh my. Tomoyuki Tanaka, we need you now!! "Humans are totally different from butterflies and they should be far more resistant". Really? “Charlton Heston Reads Crichton on Our Arrogance ... March 2, 2007 ... radiation is good for life ... Many forms of life will thrive with more” and “Wednesday Quotes: Pearls of Wisdom ... September 14, 2011 ... " I know liberals like every square inch of my glorious naked body ... "” (the old, ugly and evil Rush “looting” Limbaugh whistlesucker performing and perfuming the stink at rushlimbaugh.com). Really? Researchers are paid to remove the wings off of butterflies? Yeah, right... just another attempt to convince us evolution is real. LIBERAL BIAS. Evolution does not occur rapidly as a response to a single short-term environmental disaster such as this. This issue described in the article talks about immediate damage to a species due to an accident. Human has more longer life than butterflies. So it will take a more longer time to identify if the radio active effect will give harm to human being. You may want to reconsider your statement and do a bit of fact-finding... actually, in extreme cases, humans can die in a matter of days or hours when exposed to large doeses of radiation. It has happened several times throughout history.